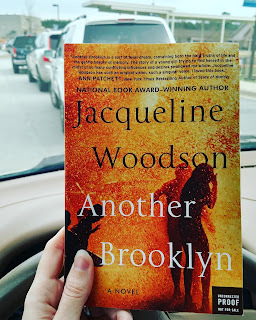 Earlier this week, I read the powerful book Another Brooklyn by Jacqueline Woodson. This is the first adult book by the award winning children’s author. (If you have not yet read the lyrical Brown Girl Dreaming which won a National Book Award, start there.) Woodson is a phenomenal poet – she even has held the title The Poetry Foundation’s Young People’s Poet Laureate. Since I loved Brown Girl Dreaming, I was anxious to read her first adult novel. And it did not disappoint. Another Brooklyn tells the story of friendship for four girls growing up in Brooklyn in the 1970’s. The main character, August, tells the story back through a series of reflections as she is now an adult studying death as viewed by different cultures. As a child, she was moved from her southern home abruptly after a tragic incident involving her mother. (Side note – Woodson actually grew up in Greenville, South Carolina before moving to Brooklyn herself.) In this new setting without a mother, August becomes dependent on three girls in her neighborhood. For any females who have had strong female ties, you will recognize the camaraderie between the quartet. And, you will also recognize how deeply those same friendships can hurt. Woodson uses her standard lyrical prose to write a moving story that readers can relate to in some cases (depending on life experiences) and learn from (again, depending on life experiences). For example, August repeatedly tells the audience that she did not realize how close to poverty she lived. They were poor, but not “that” poor. Or, at least, this is what is seemed like to her. One of the most incredible things about Woodson, as a writer, is that while the novel is shorter than most and uses fewer words, she paints a picture that is unforgettable. Each character is nuanced and vulnerable. I made the mistake of taking this book with me while waiting for my son in the after school car pickup line not knowing that the ending of the book was a highly effective gut punch. I was shocked, saddened and impressed with the way Woodson let the story play out. It will be a long time (if ever) before I forget the characters or the way their stories played out. And, that is a sign of a good book. I encourage you to check out Jacqueline Woodson’s books either for your children or yourself. You won’t regret it. You can purchase it here or put it on the hold list at your local library.